Are strong traits really strengths? Or, are they potential derailers? Most assessments recognize that strong traits can be derailers but deal with it by simply acknowledging the person could sometimes exhibit the related derailing trait. Only Paradox Technology determines if a strong trait is actually a true strength, or a derailer. Every trait can be a strength or a derailer depending if the trait is balanced by another seemingly opposite (paradoxical) trait. For example, if a person is strong in both Frankness and Diplomacy, both will be genuine balancing strengths when communicating. On the other hand, if a person has only one of the paradoxical traits, there will necessarily be a related counter-productive behavior, the strength of which depends on the extent of the imbalance. For example, a person with very strong Frankness and weak Diplomacy, will have a strong tendency to be disruptively blunt which leads to unnecessary upsets, mistrust, and employee turnover. 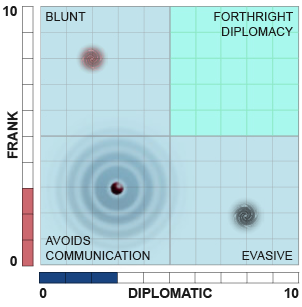 Conversely, a person with very strong Diplomacy and week Frankness, will have a strong tendency to be evasive when communicating, causing unclarity and unresolved issues. In some cases, the person is weak in both Frankness and Diplomacy indicating they will try to avoid communication. The key is to appreciate and strengthen both sides of the paradox. People who are imbalanced in a paradox tend to demonise the trait in which they are weak. For example, people who are strong in Frankness and weak in Diplomacy will see themselves as truthful and will consider Diplomacy to be untruthful. If they are challenged about being blunt, they may say "Do you want me to lie?" Or, "Do you want me to sugar coat what I am saying?". By understanding the balances related to paradox, they can begin to understand the negative consequences of their imbalance and start to develop a balanced approach to communication. ParadoxTechnology analyses and determines a broad spectrum of potential counter-productive traits without having to ask negative questions on the questionnaire. This is vitally important since negative traits usually account for 60-75% of the factors that impact job success. Paradox Technology measures how employees manage 12 paradoxical pairs of behaviours, each of which relate to an important core value. There are four interpersonal core values: Confident receptiveness (Truth Exploring), Self-Accepting Humility (Healthy Self Esteem), Forthright Diplomacy (Effective Communication), and Helpful Assertiveness (Mutual Benefit). There are four Achievement core values: Logical Intuition (Decision Approach), Poised Achievement (Motivation), Creative Persistence (Innovation), and Flexible Organizing (Organization). There are four Leadership core values: Mindful Courage (Strategic Risking), Compassionate Enforcing (Holding Others Accountable), Authoritative Collaboration (Participation & Delegation), and Realistic Optimism (Strategic Acumen). All of the Harrison Paradoxes relate to leadership and have a great impact on the organization which can either create a positive culture or a dysfunctional culture. For example, self-confidence can be a great strength for a leader but if it is not balanced with considering other ideas, self-confidence becomes dogmatism which stifles innovation and causes employee turnover. Conversely, leaders who are receptive to different ideas without having confidence in their own views will lack clarity and decisiveness which leads to confusion amongst the team. Harrison Paradox Technology is embraced by organizations world-wide as the best means to determine leadership capability and job performance by providing a reliable map of the paradoxical balances that make or break leaders.